About four months ago, I had the pleasure of being interviewed by Merle English, Newsday writer/reporter, about my election as President of Kady Brownell Tent #36, Daughters of UnionVeterans of the Civil War, 1861-1865. In addition to my membership and publicity initiatives, we spoke about my Civil War ancestor and several other people I discovered hiding up there in the branches of my family tree, including the most infamous ancestor I have: Rebecca Elsing Mudge Greensmith. Rebecca, whose maiden name is unknown (all three surnames are from her three marriages), was executed alongside her third husband, Nathaniel Greensmith, for the crime of witchcraft in January 1662/3, and her damning confession invites all sorts of speculation as to why a woman would destroy herself so utterly before execution (my personal theory: she was forced to do so). 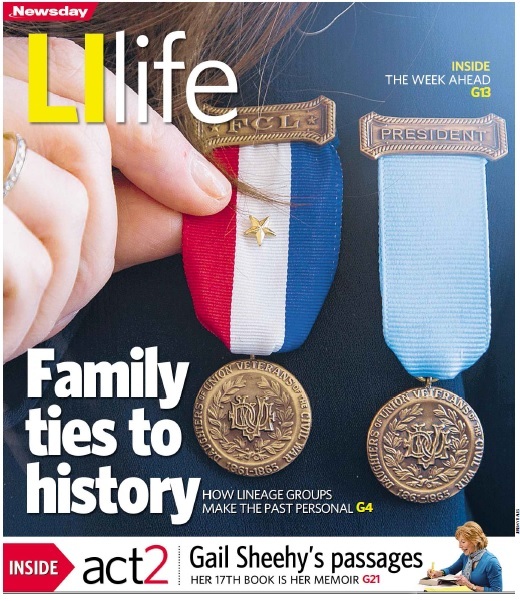 The article "Family Ties to History: How Lineage Groups Make the Past Personal" ran in Newsday’s Long Island section on March 15th, 2015, and includes quotes from my husband and my friend Betsey about the genealogical societies to which they belong. I’m so grateful to Merle and to Newsday for publicizing Kady Brownell Tent #36 and the rather excellent hobby of genealogical research. The only problem is this: Kady Brownell Tent #36 has a Facebook page, but it still doesn’t have its own web site. I’m developing one; it’s completed but must go two approval processes (at the state and national levels of DUVCW) before it “goes live.” So, I wanted to post some information here for prospective members regarding how to contact the tent, in case they’re ready right now and would rather not wait for a web site to provide instructions. Here it is: For information regarding Daughters of Union Veterans of the Civil War 1861 – 1865’s membership qualifications, please visit the Membership page on the New York Department DUVCW web site. Guidance on how to find your Civil War ancestor through research may be found here. If you're interested in joining Kady Brownell Tent #36 right now, please click on this link and fill out the form, choosing "Long Island & NYC" from the drop-down menu as the tent location closest to you. A member of our tent will contact you with more information. Questions may be directed to us via email at KadyBrownellTent36DUVCW1@gmail.com. We're happy to help anyone who’d like to join us.